It's fun to cellar beer. You get to buy something cool, and you still have it months or years later. At some point you can amaze your friends by opening that oldie but goodie. But there are risks involved. All beer will eventually be too old to drink, even beers that age very well. You invested some money and some storage space on that beer -- how long is too long to keep it? I've been known to say that you should drink beer within two years of its bottling. Of course that's not a hard and fast rule -- on New Year's Eve I cracked a 3-year-old Roots Epic that was truly delightful -- but I claim that aging beyond two years doesn't add much benefit to most beers, and the things that can go wrong start to have more effect. After an initial excitement about cellaring beer when I started geeking out a few years ago, I'm now at the point where I'm trying to reduce the amount of beer in the basement -- and I'm not a very big hoarder by any means. One part of that equation is to not keep as much beer -- hey, those big ones age well, but they can be really good fresh also. The other part is trying to use up more of the bottles I've got. It seems like I hear more people talking about thinning out the cellar lately. Is it just me, or are a lot of people having the same idea? Are you keeping less and/or drinking more of your collection? We have about 200 bottles in our cellar (not including homebrew). Along with picking a bottle here and there to bring to events/tastings/parties, we hold maybe two cellar dip parties a year to help empty some bottles and encourage friends to bring bottles from their cellars too. I have a large wireframe shelf in our basement that stays a steady high 50 to low 60 degrees (in the hottest of months). A lot of friends ask what I will do when I run out of space on that shelf. I feel like if I need to go beyond the shelf then I have too much beer. I use the one shelf as my limit to my excessive hoarding. I endorse the two-year window. The beer has to be very, very big and usually black to continue to improve beyond that. One year is best for lots of beers--especially those that aren't bottle conditioned. I need to do thinning of my own. We should hive mind a list of beers that can survive longer. From my experience, all the big Hair of the Dogs can go for years, as can Deschutes' Abyss. Barleywines in general improve for three years and beyond. What else? @Jim: You told me you only read It's Pub Night for the articles. I am right there with you Bill. I have been actively trying to clear out the cellar while buying less beer for the cellar. In fact, my new challenge to try not to drink the same beer twice in 2012 (@NoBeerTwice2012 on twitter) is partly driven by a desire to thin the herd. That being said, I still had a hard time not buying a half dozen 2011 Abyss. Certain beers I just love to age. Oh, and we had a blast here in Austin drinking the 8 year vertical of Jubelale - most of which came courtesy of Bill! Definitely trying to thin it out. It's way to easy to buy more of these 10+% beasts than you can reasonably drink. So, who wants to get a weekly cellar thinning group together? @Kevin: I might be into a monthly gathering like that. @Jeff: Good idea, though I also like fresh barleywines pretty well. I'm leaning more and more towards not rolling the dice, just enjoying the fresh article. With exceptions, of course. @wallace: Yes! Risk management dictates that we look for cheap beer that cellars well, like this one. 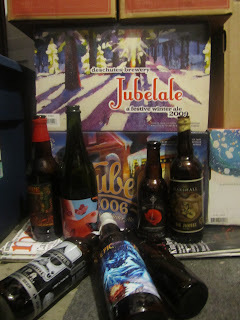 @Jason: I'm going to do a 10-year Jubelale vertical next year. I agree with you on the time.. mostly.. there are of course exceptions. I use a wine cooler, and actually lay the bottles on their sides (which i know is un-cool w/ most beer geeks) but I still have had no issues in doing this. Another rule of mine is that I will not cellar a beer that is under 9% ABV. I firmly believe a beer must be at least that strong to cellar well, and not make me barf if I drink it. Certain styles I will age longer. Typically really strong Scotch Ales, beers like Samichlaus, some strong sours, and just some to bust out that I don't like that much, but will amaze friends. I am not big on aging a lot of stouts or porters.. I tend to like them better fresh. Most barleywines I may age for only a year. If I age a Stone Old Guardian for any longer than 2 years, it makes me want to barf. Some find the terrible oxidization a treat which I find odd. In my eyes it is a spoiled beer. We don't generally cellar anything at all, on purpose that is. We stumbled on a 4-year old bottle of Pelican Brun in the wine rack in our basement, served it for New Year's Eve, and it was excellent. The time had really taken the sharp edge off of the flavor and made it really mellow. I've gotten more selective about what goes in, and less emotionally attached to rare bottles that I have, so I drink and trade them more easily than before. As a result, I think I probably have a lot less than I used to. Still, there are probably 200-300 bottles, ready to drink, tucked away here and there in my collection. I'm considering thinning that out quite a bit to help fund a big trip this year though. I don't want to ebay, and I know it's not really legal for me to sell it on my own. Got any ideas? I have been "dipping in" a lot more lately (holidays!) but we put together a spread sheet with what is in there, and I shared it with a couple friends and have noticed a lot more buzz about buying 2 or three to try one now and lay one or two down. I think the verticals we have been drinking have driven me to want to keep a few through 5 or so years. I have enjoyed tasting them in vertical from fresh to a little past perfect and everything in between! A two-year window is a good rule of thumb but not a hard and fast rule. With that said, I've had 10 and 12 year old beers that were exceptional. in my experience, mostly wild ales but higher alcohol Belgian beers as well as barley wine and imperial stouts and/or seem to do well with 2 or more years on them. @pedXer: I don't think you'll get busted if you sell some prized bottles to friends around town. I guess if I was trying to do something like that, I'd watch the Beer Advocate NW forum for meetups; depending on what you have, the BA's might be eager to buy stuff off you, especially if they think they can turn it into a good trade. Actually, maybe even post your question over there and see what the hive mind thinks.